I came across Comic Book Resources’ Top 70 Most Iconic Marvel Panels of All-Time the other day. Sure, the list came out four years ago, but I didn’t have a website then. We all know most of these panels because I guess that’s the point of the list, but I don’t think we know the stories behind them (or at least I didn’t). So how about every once in a while, I’ll take one or two of these panels and we’ll dig deep to see the stories that inspired them. Today, I chose #24 and Friday we’ll do #19. You remember seeing this somewhere before? 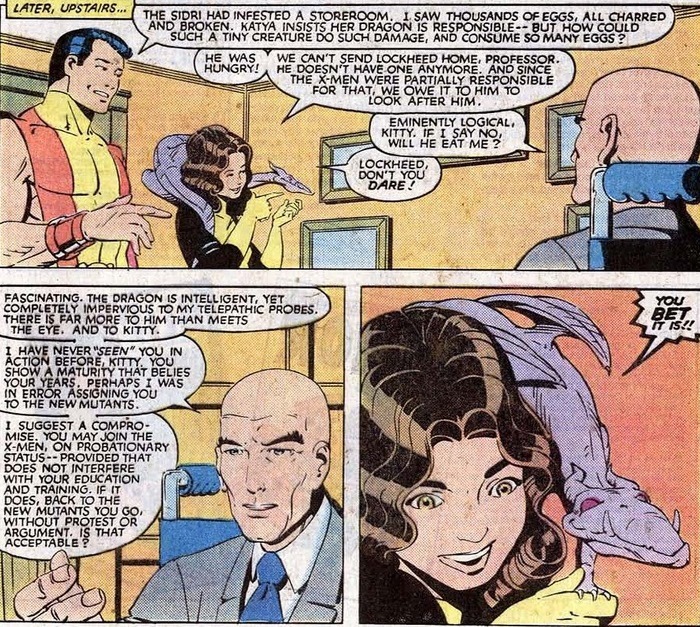 If you pick up X-Men comics nowadays, Kitty Pryde pretty much exemplifies everything we know and love about superheroes. And while today she’s probably only in her mid-twenties, the Marvel universe has her to thank for it still breathing many times over. That and she actually leads the huge roster of X-Men now (with Wolverine and Storm). I guess if you don’t count Cyclops’ fringe almost-terrorist group running around. 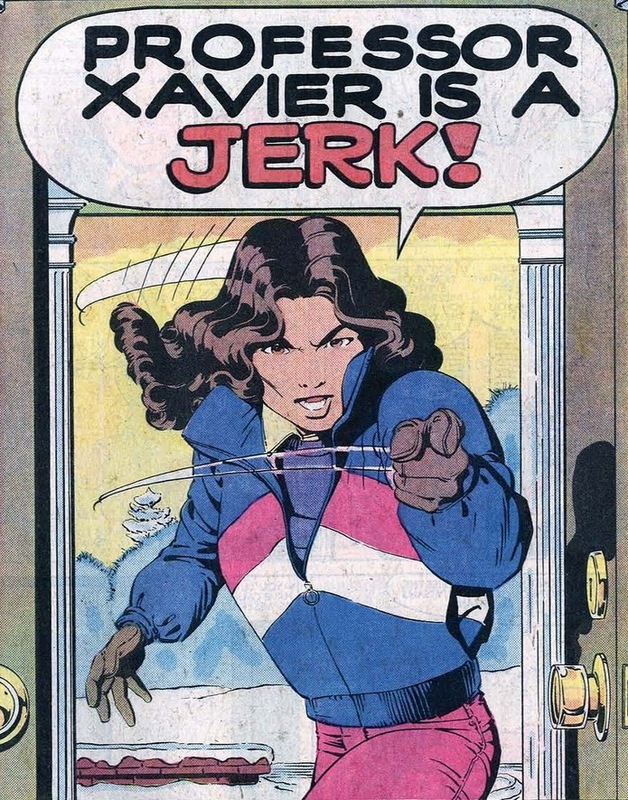 But when she first showed up in comics in 1980, Kitty premiered up as an eighth grader and by far the youngest member of the X-Men to this point. 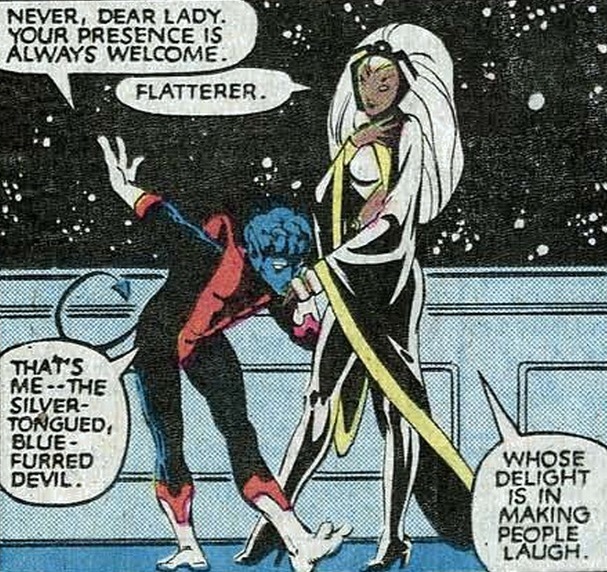 Nightcrawler doesn’t match most of Storm’s lovers (they tend to be muscular, in leadership roles, and not covered in blue fur). 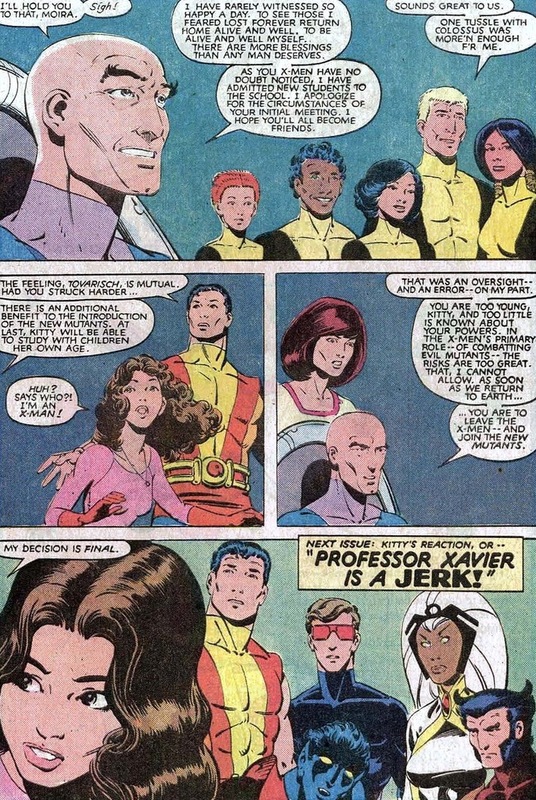 But anyway, in the next issue Uncanny X-Men #168, written by Claremont and drawn by Smith, Professor Xavier is a jerk. 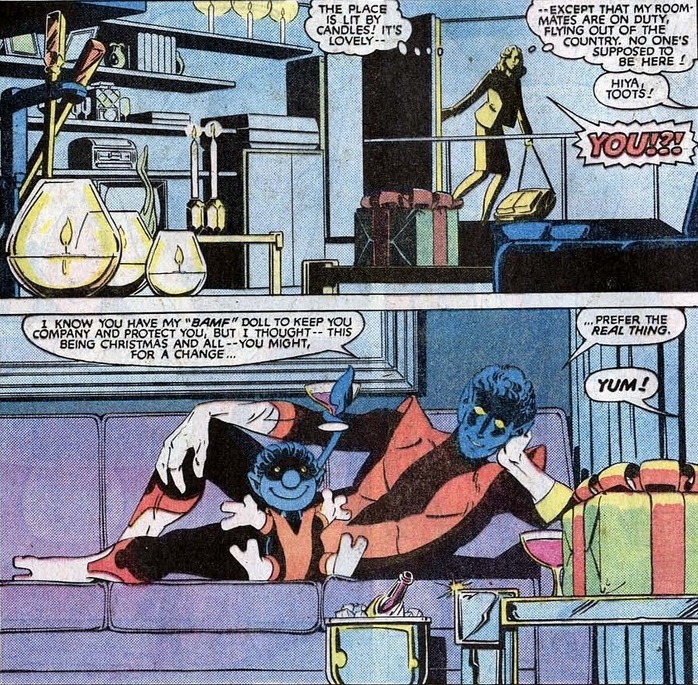 So now Kitty has to prove herself to the good professor, which may be difficult when her teammates all have the capability to grow beards and drink alcohol. Nevertheless, she tries relentlessly. Professor X can’t be moved so easily to send the child out to the Savage Land and fight dinosaurs or whatever. Of course, because the Marvel world has a dozen supervillains/bad guys to every one superhero, something inevitably goes bad. Suspicious, even. Yes, “Yum!” I think you should know that it’s not his tail holding the glass of wine. Anyway, something fishy in the basement with electronics or something. Kitty investigates, because gosh darn it, that’s what real X-Men do. Yes, her codename used to be Sprite. 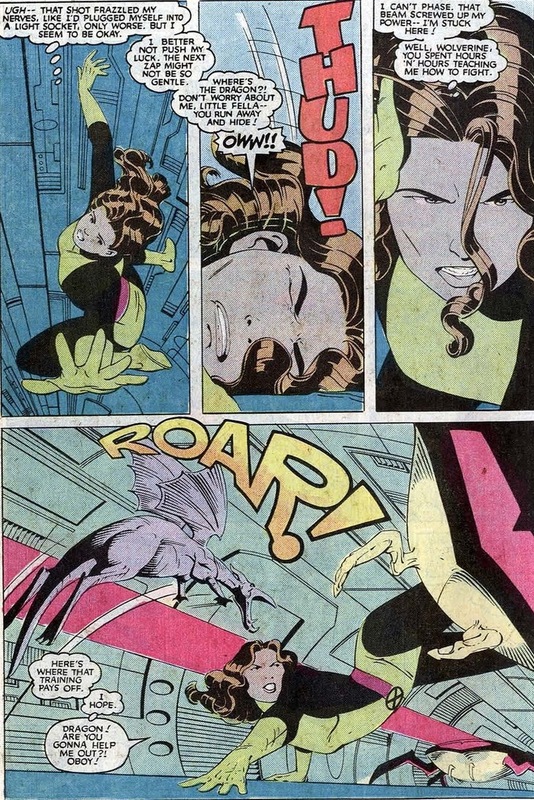 And Shadowcat. Also, did you know Kitty has a pet dragon? She proves her worth through three or four pages of her and Lockheed jump kicking giant laser bugs. In about a year, she receives her certified ninja training right in the heart of Japan by the supervillain/ninja master Ogun. Fictional characters accomplish far more than we do in far less time. 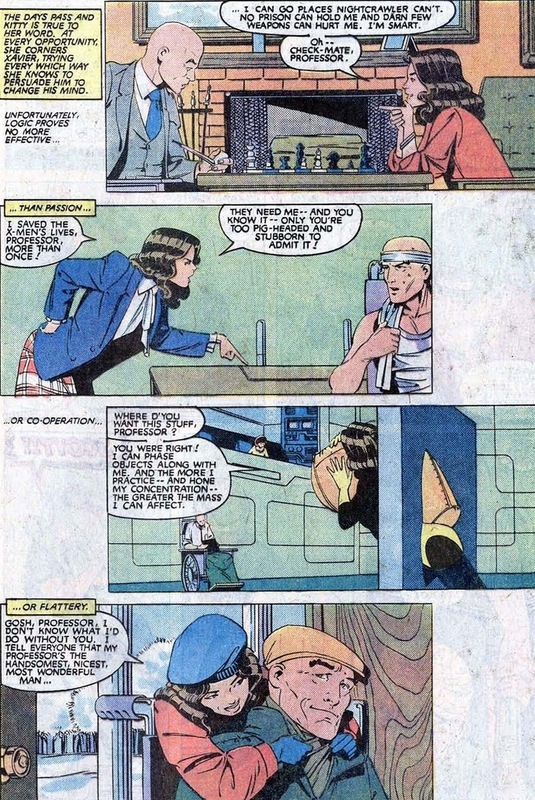 Professor Xavier may be a jerk, but he can see her potential’s wasted with those idealistic, optimistic teenagers over in the New Mutants. Let her uppercut Sentinels if that’s what she wants to do. 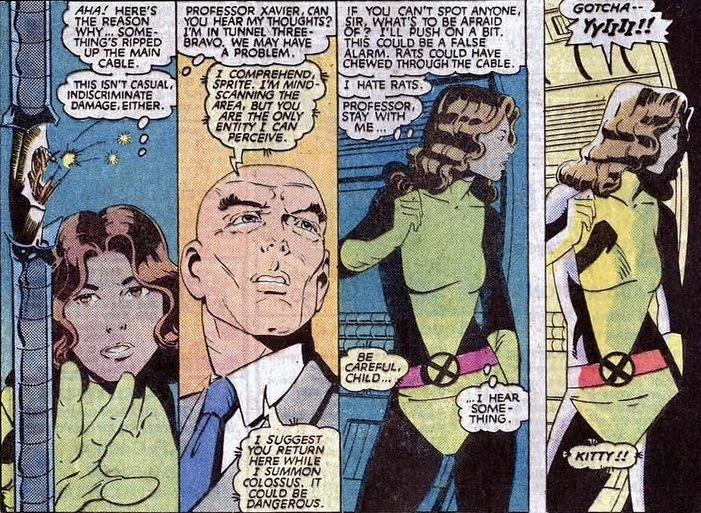 And that’s the story of how Kitty Pryde joined the New Mutants for one issue. Daredevil on Friday! Small note: Kitty hadn’t gotten her ninja training yet. 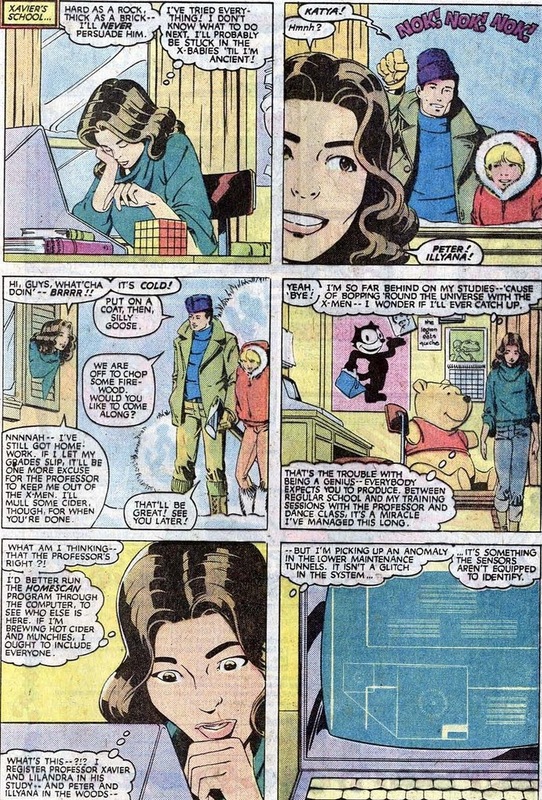 That came a years later, in 1984/5’s Kitty Pryde and Wolverine mini. While we’re on the topic of CBR lists, this story ranked #40 on their 50 Greatest X-Men Stories. It’s a great story. Really fun. I’ll change it because I’m fond of you.